U.S. Secretary of State John Kerry and India's External Affairs Minister Sushma Swaraj during their joint news conference on August 30, 2016 in New Delhi, India. John Kerry and Joseph Stiglitz have decreed that India has an image problem, but here’s why India shouldn’t care. Another American visitor in India, another lecture on democracy to Indians. US Secretary of State John Kerry said at the Indian Institute of Technology-Delhi on August 31 that, being a democracy India should allow everyone the right to protest. He was referring to the arrest of Jawaharlal Nehru University students who had shouted slogans calling for India’s breakup. While Kerry was essentially pitching for anarchy in India, he had conveniently forgotten that American police had fired pepper spray directly into the faces of peaceful Occupy Wall Street protesters before brutally assaulting them. Two months earlier Kerry’s compatriot, the economist Joseph Stiglitz, had imperiously pronounced in Bengaluru: “India should be aware that it has an image problem. There are very few governments that have made it difficult for NGOs to operate or engage in harassment of universities. These events have had a strong effect on public opinion abroad. It puts the country in the club of countries such as Egypt, Russia and Turkey. Most people in India will not want to be in this group,” he said. However, public opinion abroad shouldn’t in the slightest bother Indians. The West always tries to steer India along the path of non-violence advocated by M.K. Gandhi while at the same time unleashing violence itself where western interests are concerned. Secondly, if India’s image were an issue, why are western companies pouring billions into the country’s economy? Why does CEO after American CEO praise Prime Minister Narendra Modi to the sky? The short answer is, cash trumps everything. Now that India is rising, everyone wants a free ride on its momentum. At any rate, western governments have no problem with the unsavoury image of some of their friends. For instance, the US and UK’s best buddy in the Middle East is Saudi Arabia, which executes people in exactly the same way as ISIS. The West has been a patron of murderous rulers in Chile, Pakistan, Nicaragua, South Africa, Indonesia and Ukraine. Again, China executes more prisoners than any other country, but western governments conduct record levels of trade with Beijing. Both Kerry and Stiglitz come from opposite sides of the political spectrum. Kerry, although he belongs to the Democratic Party, is a closet neocon and an integral player in US efforts to stave off multi-polarity in international relations. On the other hand, Stiglitz has welcomed the rise of the BRICS group. It is highly likely these two Americans were despatched by the US elites to convince India’s leadership to roll back the ban on US-funded NGOs such as the Ford Foundation – which was established by the CIA – and Amnesty International, which has been served a warning by New Delhi for promoting Kashmiri separatists. Both these organisations – in sync with other NGOs – could be feeding the US intelligence machinery. In this backdrop, the Americans would be desperate to prevent a ban. Western governments use lobbies and NGOs to gain influence in developing countries. But in India they have another bunch they can rely on. These are the Macaulayites – a class of Indians who are Indian in look but largely western in their outlook. They are named after the colonial Thomas Macaulay, who advocated the complete destruction of Indian education, society, religion and culture so that India would be populated by English speakers who would be loyal to Britain rather than India. Many of them populate the Indian media and social circles – mostly in New Delhi – and can be relied upon to back the West. If you find that hard to believe then can you explain why the entire student body at the Indian Institute of Technology-Delhi kept quiet when Kerry talked down to them about human rights, democracy and India’s “image problem”? Instead of reversing the gaze and asking Kerry why he was lecturing India (when it is the US that has an image problem; in vast swaths of the globe the US is intensely disliked), these students merely laughed at his joke about Delhi’s waterlogged streets. The reason could be that the overwhelming majority of IIT graduates leave India for Silicon Valley for jobs or further training. They will not risk a visa denial. However, Macaulayites are a mere sideshow. Great nations like India do not worry about image. They care about power. 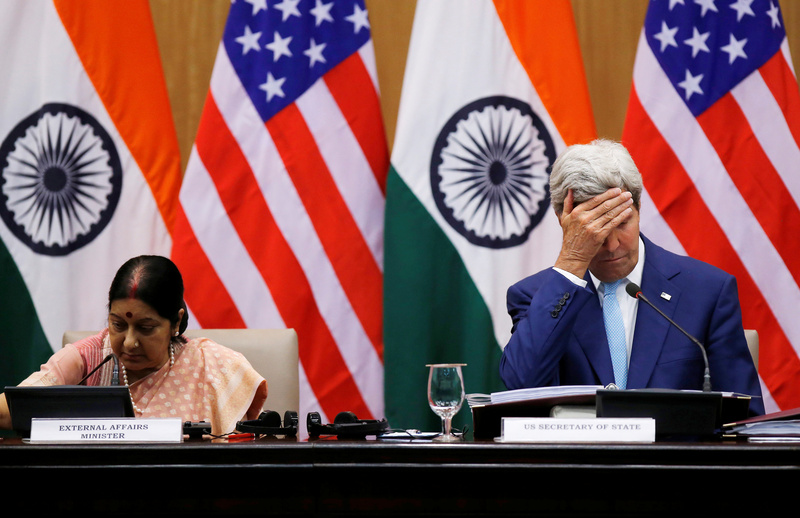 India is an increasingly powerful country while the US is a relatively declining one, so when the likes of Kerry come sermonising, Indians should know their strength and learn to tick them off. But first they should stop fussing about image. Like India, Russia too has suffered from an image problem in the West. The West has propagated the image of Russians as natural enemies and not being civilized enough. In an interview with Time magazine, President Vladimir Putin said the US treats Russia like the uninvited guest at a party. “We want to be a friend of America,” he says. “Sometimes we get the impression that America does not need friends" but only "auxiliary subjects to command." In 2013 at the G-20 summit in St Petersburg, when former Prime Minister David Cameron criticised Russia for defending Syria from West-backed terrorists, Putin aide Dmitry Peskov said Britain is “just a small island … no one pays any attention to them”. India’s political leadership and diplomats should emulate Russia, which didn’t offer an explanation – let alone an apology – for kicking out USAID, the British Council and sundry Christian evangelical churches, all of which are fronts for western intelligence. In July 2016, Russia's anti-extremism law that restricts evangelism and missionary activities went into effect. Under the new law, foreign missionaries will not be allowed to speak at churches unless they have a work permit from Russian authorities. Similarly, any kind of discussion about god with non-believers is now considered a missionary activity and punishable by law. Is America trying to embrace or contain India? Named after the bill's author, Irina Yarovaya, the Yarovaya Law contains police and counterterrorism measures that grant state security agencies the authority to access private communications, regulate Christian proselytizing on the internet, and requires telecom companies to store phone conversations, text messages, and videos for six months and provide that data to the government. The Russian prosecutor general's office has added two US-based NGOs to its list of foreign NGOs whose activities are deemed “undesirable on the territory of the Russian Federation”. According to the office, the work of the International Republican Institute (IRI) and the Media Development Investment Fund (MDIF) "poses a threat to the foundations of the constitutional system of the Russian Federation and state security". The IRI is based in Washington and funded by the US Congress. Its board of directors is chaired by the virulently anti-Russian – and mentally unsound – Senator John McCain of Arizona. It is curious the IRI was allowed to function at all in Russia. There is wide ranging support to these measures from the highly informed Russian public which knows the West only wants Russia to step aside and stop interfering in its ruling of the world. Most Russians you talk to seem to be aware of the West’s intentions. However, in India, the public may or may not be informed on a particular issue, but the leftist media and the centre-left political parties tend to misinform and create such discord that the real issue gets sidetracked. For instance, in the JNU controversy, the media, the communist parties and the Congress rushed to defend the students who were calling for India’s breakup and paying respects to an executed terrorist. This is unimaginable in Russia, where the vast majority of the public know that NGOs, liberals and left of centre parties are often – to borrow Lenin’s phrase – “useful idiots” who believe they are working for their own case but are in reality working for western interests. The good news is that India, under Modi, is not backing down from its stance towards NGOs working for western or evangelical interests. It has already put the Ford Foundation on notice, asking it not to fund any Indian organisation without central approval. USCIRF was being hypocritical. During the 2012 US Presidential elections, European monitors – who came to watch for fairness in American states accused of attempting to disenfranchise Blacks, Hispanics and other minorities – were threatened with arrest in Texas by the attorney general, who said their presence was “legally irrelevant in the United States”. If states like Texas would rather be considered macho than fair, why should India carry the image albatross around its neck? A great nation like India shouldn’t care for certificates of good conduct.